Promoter Frank Warren said a bout between Fury (left) and Wilder was 'official'Tyson Fury vowed to knock out WBC world heavyweight champion Deontay Wilder as their bout was confirmed in the aftermath of the English fighter's dominant win over Francesco Pianeta.The pair exchanged words as Fury's promoter Frank Warren said the bout was "official" and added more details would be made public in the next week.Wilder said Fury would "experience" being knocked out for the first time. Fury, 30, won all 10 rounds to secure a points win over Pianeta in Belfast. "One thing I promise when I go to Las Vegas is I am knocking you out," he told Wilder, 32.The American, who was holding his belt as the pair took turns on the microphone at Windsor Park, responded: "He has never had the WBC belt. If he even thinks about that belt, he better wake up and apologise to me as he will never have this." 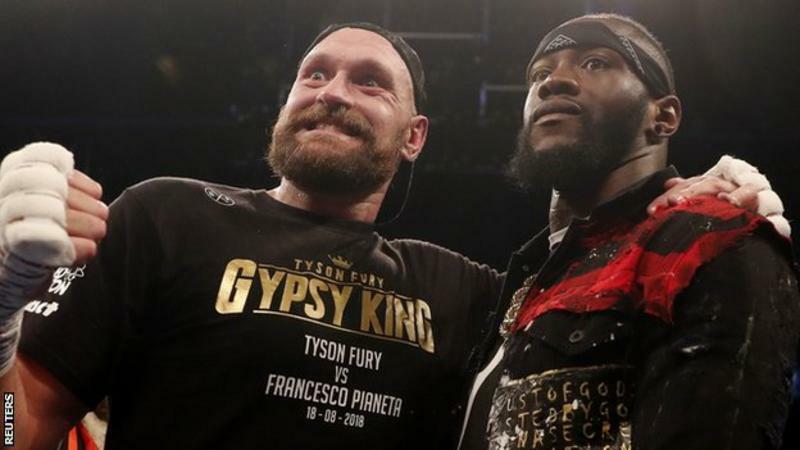 Wilder embraced former England footballer Paul Gascoigne ringsideThe prospect of a bout between the two seemed close in January 2016 when they clashed in the ring following Wilder's victory over Poland's Artur Szpilka.But Fury did not fight again until June this year, and taking on such a formidable opponent so quickly after his time away seemed unlikely until talks gathered momentum in recent weeks.Fury, who showed sharp movement and focus throughout his win over Pianeta, has secured the fight after drawn-out - and ultimately unsuccessful - negotiations between Wilder and WBA, IBF and WBO champion Anthony Joshua. "We have two men who will fight anyone," added Fury. "This man has been trying to make a fight with another chump. "They called, I answered. I said: 'Send me the contact.' They sent it. I said 'yes'." Fury looked far more focused than he did in his return to the ring in JuneWarren has not yet confirmed Las Vegas as the fight's venue, but boosting pay-per-view interest will now fall into focus, and two of the sport's most vocal characters will need little help in delivering sound bites.There have been warm words exchanged in the past, with Wilder praising Fury for battling mental health issues and the Briton insisting his rival deserved more from negotiations with Joshua.But, when the talking is done, Fury will need all of the evasive footwork he showed against Pianeta and more against a man with 39 knockouts from 40 bouts.In easing past Pianeta on the undercard of Carl Frampton's bout with Luke Jackson, Fury often slipped shots and showcased his natural skillset in switching from orthodox to southpaw in patches.His Italian rival, who now has five defeats from 41 bouts, never looked in deep trouble but Fury did not seem intent on scoring a knockout and after some boos from those in attendance, stated he was pleased to get 10 rounds as he settles back into the sport.Fury constantly flicked the double jab to maintain distance and there were flurries of ferocity, notably a beautiful right hand-left hook combination in the fourth and a right hook from range in the seventh.His corner warned against complacency before the sixth round, such was his relative comfort, but Pianeta cut a frustrated figure against a mobile target. The display was unquestionably more honed and focused than his farcical return against Sefer Seferi in June.The victory was Fury's 27th in succession and sets up a landmark occasion which will fall three years on from when he became a world champion with a stunning win over Wladimir Klitschko in Dusseldorf. Fury was briefly booed by some in the crowd after a controlled displayFormer world middleweight champion Andy Lee on BBC Radio 5 live: There were times when he could have stepped on the gas it seemed like he consciously took a step back and allowed Francesco Pianeta to get through the 10 rounds.A good solid, professional performance, he got invaluable rounds.British heavyweight David Price on BBC Radio 5 live: It wasn't imperative that he got the early finish but I think it was important to build the momentum towards the Deontay Wilder fight because it would have got people even more excited.But the important thing was getting the win. He probably lured Wilder into some type of false sense of security as well because there wasn't much power in his punches or explosiveness.